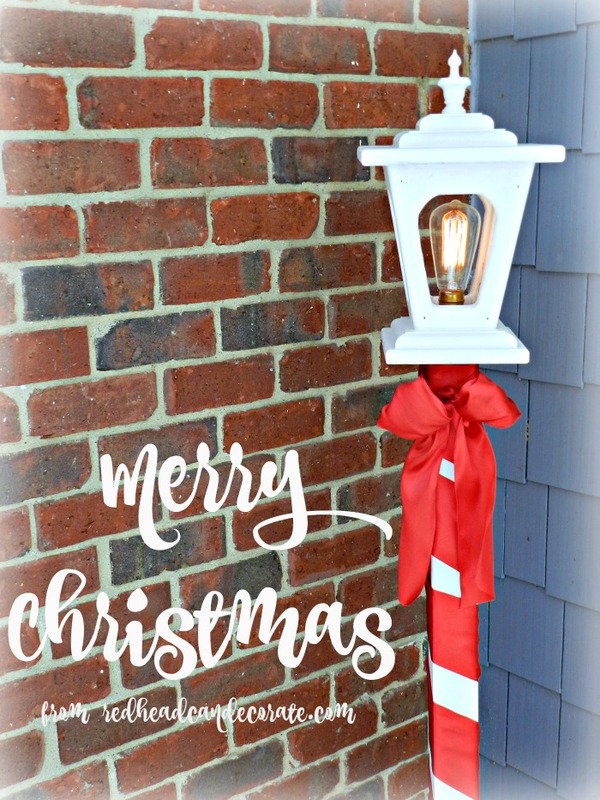 I have 2 sweet DIY Christmas project stories for you today, and then I will be signing off to celebrate Christmas with my family! 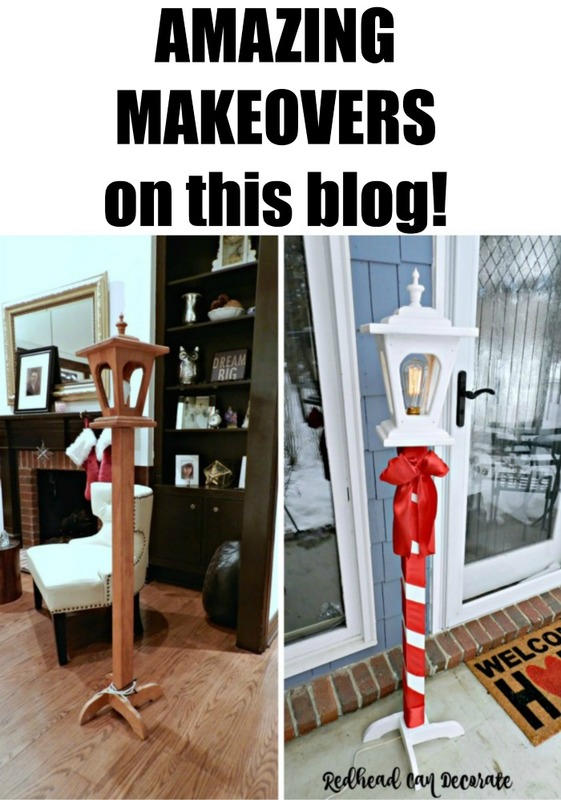 First up, is this cute “Christmas Light Post Makeover”. My Dad texted me a photo of this rather dated old light post last Summer, and I wondered where in the heck he would find such a thing? What the what? I asked him about it and he said I could have it if I wanted it. You see…he was walking down the hall in my parent’s retirement community in Buffalo and a neighbor had put this out in the hall with a sign on it that said “FREE”. Well, my Dad hopped on that sleigh ride right away and grabbed that sucker and took it home to see if it worked. Indeed it did, and he figured I would find a way to make it look pretty. I hopped on that sleigh ride with my co-pilot Dad, and I brought this thing through Canada and back home with me to Michigan. It sat in our garage until a of couple weeks ago when I got busy cleaning her up. It really was quite simple, but turned out so pretty! After a little dusting, I painted it white and it only took about 2 1/2 coats. The last 1/2 a coat was mainly on the top lantern area. After it dried, I wrapped the thick red ribbon around it and secured it with tiny nails. Then I tied the big bow on top. Lastly, I added a vintage light bulb like this one: VINTAGE BULB. What a difference those light bulbs make. It really was such an easy little makeover. What makes me love it even more, is that my Dad and I partnered up on this one. I now have it displayed in our hall, but I have had fun moving it around. I promised 2 DIY Christmas projects, so I shall deliver.. 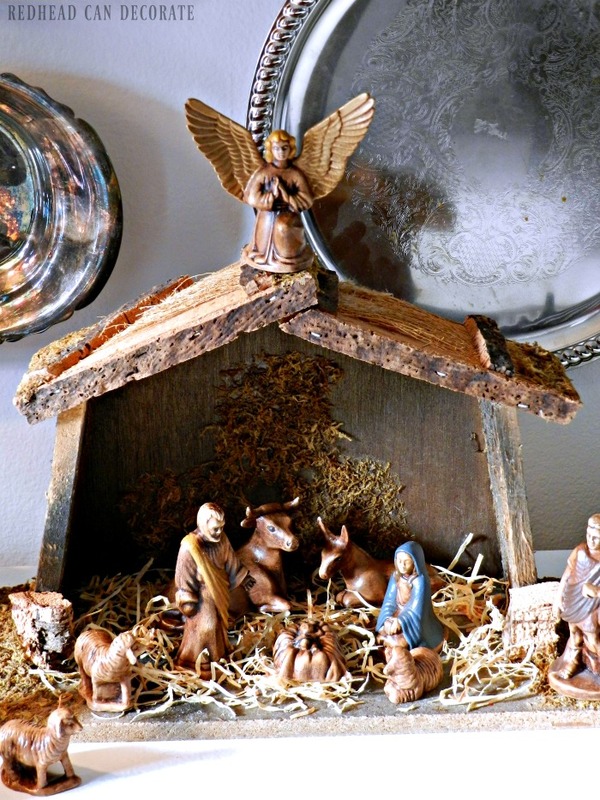 This beautiful “Vintage Nativity Scene” is also very special to me and I actually had nothing to do with it. My brother, Bobby, made this in ceramic class in 1975. As most of you know, my brother passed away at the age of 35. I inherited his nativity set that my Mom would proudly display on her cedar chest every Christmas. It’s a tradition I honor. Each year, I have my kiddos unwrap each delicate piece, kiss Jesus, and then set up the scene. We do the same when it comes time to wrap them back up for safe keeping. Here you can see Bobby’s initials engraved in the bottom. 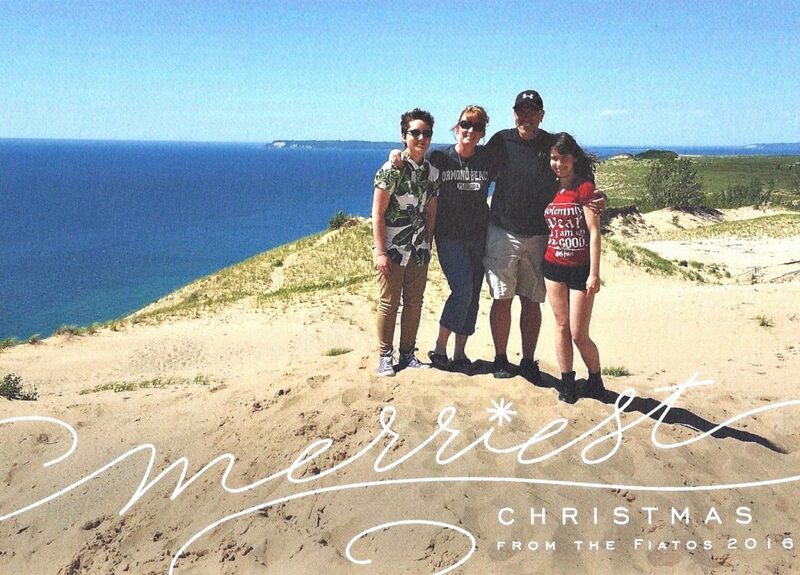 From my family to yours…Merry Christmas! Where did you get your cool light bulb? Are they easy to find? PS If you figure out how to clone your Dad next year, I get dibs. So precious! So special! So cute! Thank you so much for sharing. What a great Nativity scene! What memories it holds! Glad you get to show the love and share the love of you and your brother with your children! Awesome! 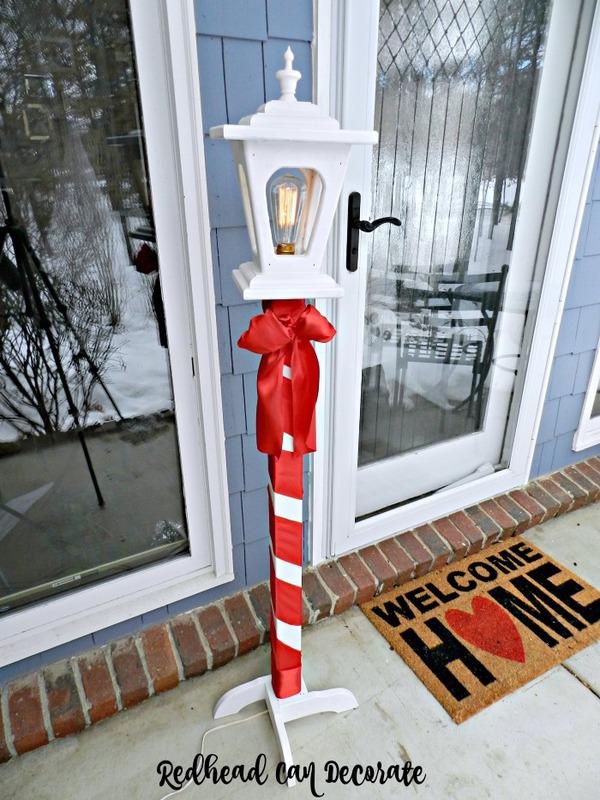 The lighted post is a great find and you and your dad did a great job! Thank you for sharing and Merry Christmas. 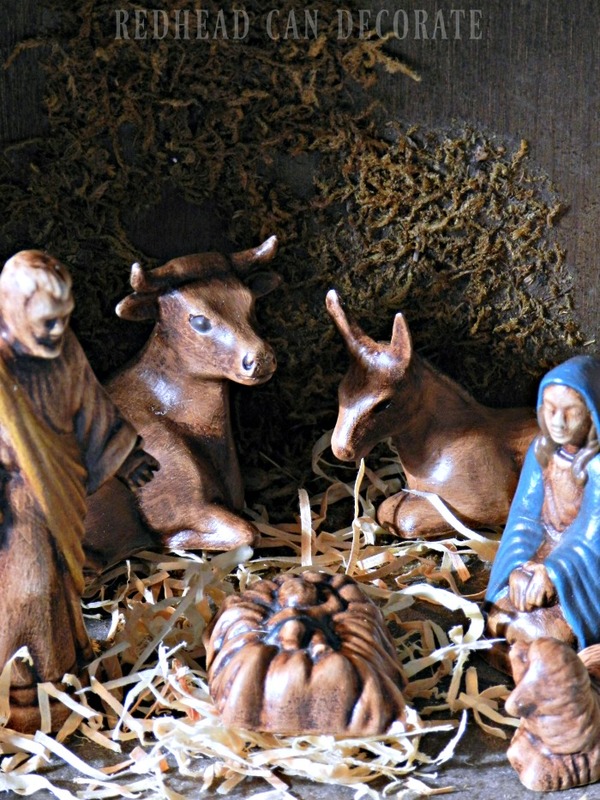 Your brother’s nativity set is painted, antiqued beautifully! Oh my gosh! You Dad has a very good eye, spotting that lamp post and you did an awesome job of beautifying it. Love it. 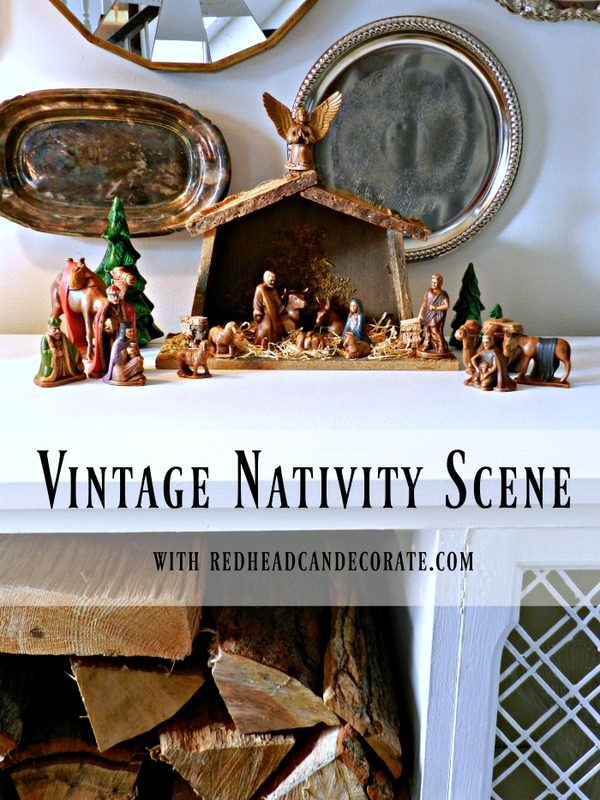 Your nativity scene is so very special since your brother took such care in making and painting it. What a wonderful way to have your brother there with you at Christmas. It’s such a beautiful, large and getting old, set. Merry Christmas to you and your family and i look forward to seeing your upcoming posts in the new year. Beautiful Nativity! What a treasure made by your brother. Julie ~ I especially loved see your nativity set that your brother Bobby made in ceramics class. He did a really good job! ~ I made a Santa Claus plate & one of those big ceramic Christmas trees about the same time, way back when!…and I still have those pieces too! ~ I love that you honor your brother’s memory by having him still be a part of your lives, by using the nativity scene in your décor. I didn’t notice if there was an angel with that set, but I would say Bobby is for sure! ~ (our angels r always with us, I believe that)…. I hope you have a wonderful weekend this Christmas ~ I have really enjoyed all your beautiful ideas & creations you made this month, as always, thank you for sharing! I will tell him, Becky! Both are so beautiful and love the stories to go with them. Your right the painting is just amazing. Your beautiful Nativity and its story brought tears to my eyes. What a treasure for your family, and every year it continues to bring joy to you and honor your brother. May you and yours be blessed this Christmas and always. Thanks Julie, for sharing a great story about the Nativity display! It is truly lovely. Your light fixture is just great! Thanks to Dad for sharing it, and kudos to you for such a great “rescue”! LOVE the Lamp Post. Great job, Julie you are the best. Thank you and have a very….Merry Christmas. Another fab find (thanks to Dad in NY). 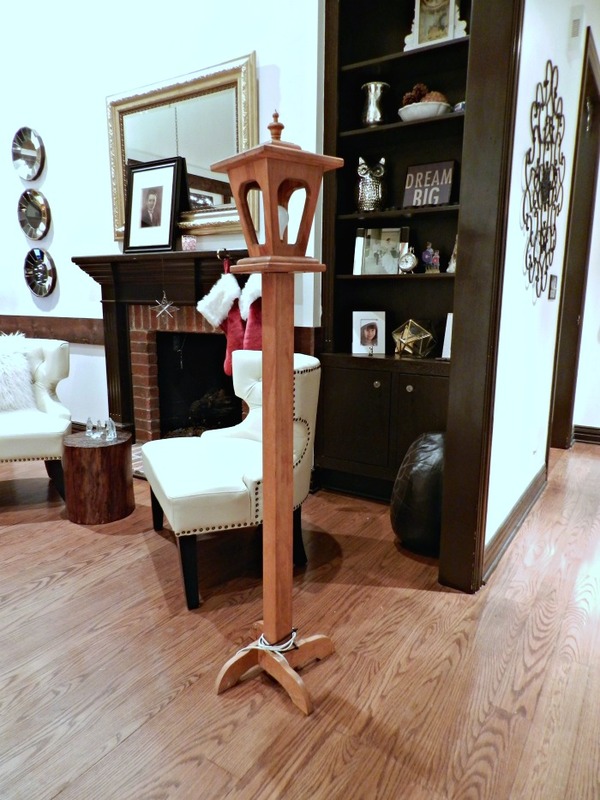 I love what you did with it; great accent wherever you put it! The nativity set is truly a treasure for you and your family; a tradition for your daughters to carry on. Thank you for sharing this post. Turned out so cute! Your dad is the bomb girl!???? Yay for dad!! That is so cute! 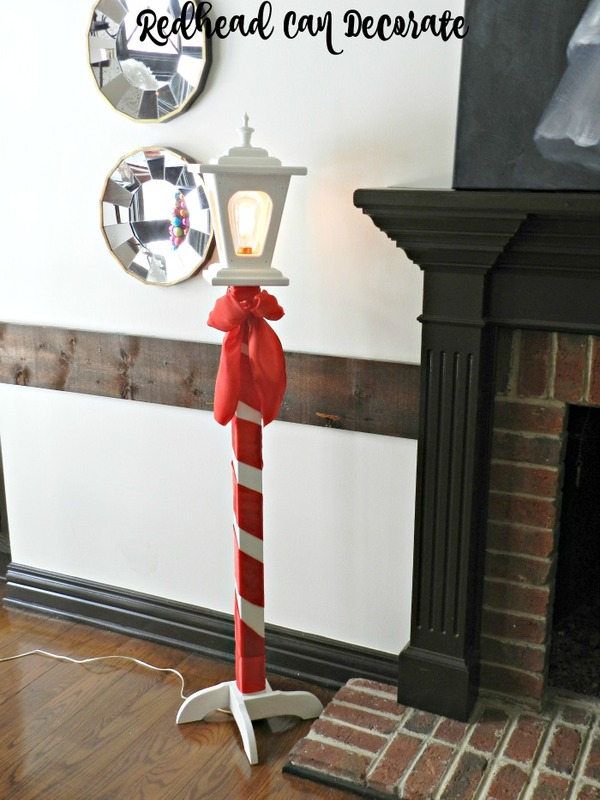 Just opened your email and saw the lamppost and fell in love with it. You say you found it in Canada, Wish I could find one like it. 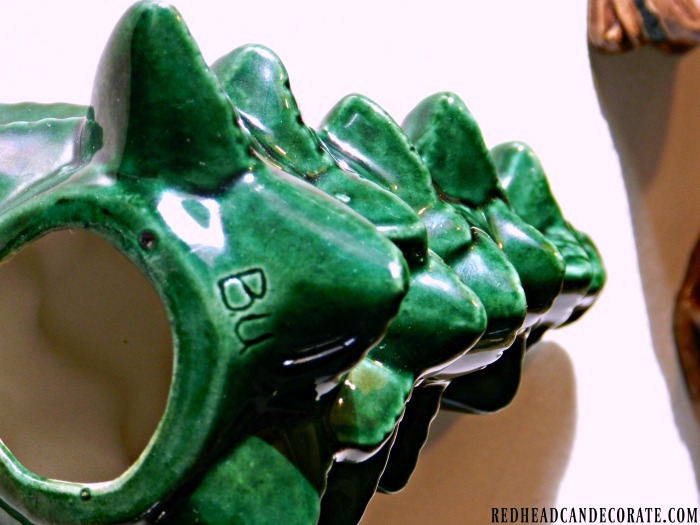 I might get my husband to make me one. How is it wired, looks like the post is hollow. It looks so nice as an outdoor Christmas decoration. Good morning! We didn’t find in Canada. My Dad found in his building. Such a great story!